The SEW-Eurodrive screw conveyor drive is suitable for a large variety of applications requiring movement of bulk material both vertically and horizontally. Their screw conveyor drives differentiate themselves in the marketplace by shipping in a gearmotor configuration, or as a gear unit with c-face motor adapter, both of which relieve the customer of maintenance costs and efficiency losses inherent with belts. Competitive methods often require a motor mount, motor, belt and belt guard that are not assembled prior to shipment. A wide variety of gear ratios are available for each size to give our customers the correct output speed and service factor. SEW-Eurodrive screw conveyor provides torque from 1,770 lb-in to 115,100 lb-in with output shafts and flanges to accommodate CEMA mountings. 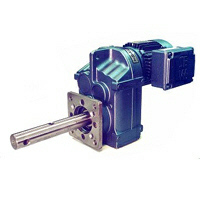 Additional shaft configurations are available if required. Bearing life in the gear unit is rated at 10,000 hrs minimum as a basis for design. CEMA screw conveyor drives are created using SEW-Eurodrive’s “Snuggler®” (FAZ) gear unit for offset parallel configurations and the helical-bevel (KAZ) gear unit for right angle applications. The standard 2-hole straight steel shaft is constructed for use with a waste pack seal which can also be provided as an option. The product range covers sizes 37-127 in the FAZ and KAZ configurations with torques ranging from 1,770-115,000 lb-in. Purchase your SEW Eurodrive Screw Conveyor Drives today!